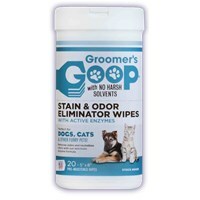 Groomer’s GOOP is specially designed to gently remove the most difficult stains, whiten yellowing areas, deal with stud tail, ear wax and ear medicine, tar from the beach, sap from trees, excessive grease and oil on the coat – even skunk musk. 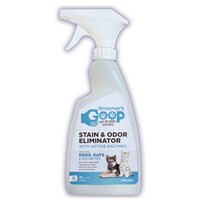 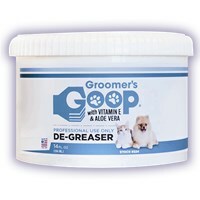 Groomer’s GOOP will leave your pet’s coat clean, lustrous, full of body and grease-free. 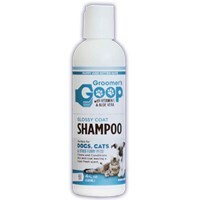 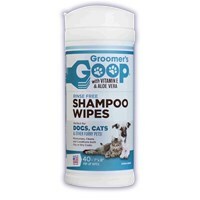 Groomer’s GOOP offers a complete line of pet de-greasers, shampoos, conditioners, rinse free shampoo wipes, plus leave-in conditioning spray and coat freshening spray.